Los Angeles — and other modern megacities — conjure increasingly unique genetic profiles that point the way to a new medical industry: Call it urbo-pharmaceuticals. Investors are needed. Is there a pill that might inoculate us from smog? Is there a gene we can target that would make us resistant to resurgent infectious diseases? And is there a way to use genetic data to insulate new immigrants from some of the metabolic challenges of living in a new land of plenty? Welcome to the slowly emerging world of environmental medicine and its inevitable outgrowth, environmental pharmaceuticals: compounds specifically suited for mitigating the physiological challenges of mega-city life in the 21st century. The inchoate drive for such pills — disparate, proceeding in entrepreneurial fits and starts — is fueled by twin facts. First: Inflammation, the chronic-over-firing of the body’s immune system, now sits at the core of almost all scientific discussion of chronic diseases, diseases that persist despite thirty years of lifestyle advice, medication and surgical intervention. Asthma and COPD, considered among the world’s top medical concerns, seem to be activated by special sets of genes, some of which accentuate the impact of smog (along with tobacco smoke, the principle culprit in the industrialized world). Other genetic profiles seem to mitigate it. Researchers at the University of Southern California have identified both versions. In the Latino population, mutations in liver genes, particularly one well-known one named CYP450, seem not only to fuel alcohol abuse, but also to accentuate some of its gravest consequences: fatty liver disease and cirrhosis. Heart disease, as well as problem pregnancies, uncontrolled diabetes, and even sleep apnea, are increasingly driven not just by the traditional devils of unhealthy lifestyle and poverty, but by genes activated by uniquely urban pathogens and concentrated diesel and auto exhaust. Genes governing stress responses may be at the root of why traditional antibiotics do not work within the germy reality of big cities. For years, speaking the words “genes,” “immigrants,” and “public health” was the proverbial ticket to a social and political nether-land. It was almost as bad as talking about obesity. It is still a messy brew. Yet outside of “nannyism” (not necessarily such a bad thing), or trying to scare away any new migrants (which is), what can be done? One tack might be to take a cue from modern pharmacology’s attempt to develop a pill for Metabolic Syndrome, the debilitating mix of diabetes, high blood pressure and high cholesterol now prevalent in most developed nations. Can we design an urban poly-pill, one built specifically for the inflammatory storms of the mega-city? And can we point it at what might be called the big three: the impairment of respiration, metabolism and cardio vascular processes? UCLA’s Riedl, a specialist in respiratory disease, has zeroed in on oxidative stress — the damage caused by unstable, burned-up nutrient particles in the blood stream. He knew that anti-oxidant supplement regimes have been an overwhelming bust, most of them weak and not very good at targeting the body’s native anti-oxidant systems. Then came a number of insights made possible by genetics. Perhaps the most important was a molecule dubbed GSTM1. It is deeply implicated in fighting oxidative stress from smog and other pollutants. Riedl traced the pathway upstream and found that it was driven by another gene product called Nrf-2. Then he decided to pharmaceuticalize one molecule derived from broccoli sprouts, sulphoraphane, crafting a concoction using concentrates of the vegetable mixed with daikon root essence. The result was a compound he could try out in various concentrations in humans, then measure whether its effect on Nrf-2 were, in the lexicon of pharmaceutical development, “dose dependent.” It was. The next step will be to test how well it works in people exposed to constant high levels of smog. Among urban woes, metabolic disorders are particularly troublesome. The NIH has singled out type 2 diabetes and fatty liver disease as the two biggest factors driving hospitalization, amputations and prescription drug use. Their effect on health care expenditure is huge and growing. Treatment — let alone prevention — has proved vexing. Two promising compounds are under serious study. The first is the grape skin compound known as Resveratrol. Though mainly known for its claim to extend mammalian lifespan, its true value is quietly emerging in diabetes treatment, where early clinical trials showed promising results but, unfortunately, several safety issues. And Metformin, a diabetes drug originally synthesized from the French lilac plant, may have huge protective benefits for urbanites. Researchers at UCLA Riverside have used microchip arrays to discover that it activates liver genes that dampen high insulin levels and vascular inflammation. What about the heart? UCLA heart researcher Alan Fogelman, the dean of modern HDL research, has two compounds in small clinical trials that would help the body restore its ability to make good cholesterol, a process increasingly undermined by the smog, virii and bad food of mega-cities. Both are peptides — short, protein-like molecules — that target specific gene products activated by chronic inflammation, which can include everything from the flu to sleep apnea to unchecked diabetes. The compounds are being developed by Bruin Pharma, a commercial venture in which Fogelman is a principal and an officer. Yet waiting, especially when it requires patience and foresightedness, is something we as a society seem incapable of, especially when dealing with complicated public health issues. But what if there were a faster, cheaper way? Urbo-pharmaceuticals might be one ticket. After all, we are patient and forgiving when it comes to pills and the time, cost and uncertainty that comes with their development. Chalk that up to the ease-seeking nature of humans, something for which there is no pill, but which, in itself, might drive us to invest in a poly pill for modern life. Greg Critser’s new book is Eternity Soup: Inside the Quest to End Aging (Random/Harmony 2010). 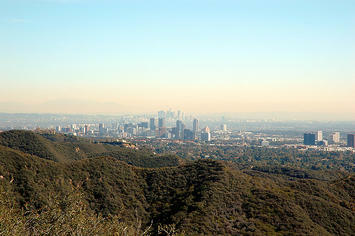 Photo by ilmungo / Luigi Anzivino, Los Angeles from the top of Temescal Canyon Trail, "...taken not at sunset, but at 11AM... that pretty peach-colored layer in the sky is the famous LA smog." Submitted by xygwfl1122 on Sat, 01/17/2015 - 09:09. Submitted by zion1122 on Wed, 08/28/2013 - 01:58. Submitted by zion1122 on Wed, 08/21/2013 - 09:10. Submitted by Frank_MD on Wed, 06/13/2012 - 22:13. It's predicted that over twenty million American residents make use of illegal drugs every month. That relates to a national average of 8.1 % of the population. In Los Angeles, the average is in fact higher than that, at 8.2 % (making it the urban center with the eighth highest possible drug addiction statistic in the whole nation). These are not small numbers. It's statistically most likely that somebody in your office has a drug addiction, and that an individual in your extended family does too. There's a one in twelve opportunity that any sort of offered American (over the age of 12) has actually eaten illegal drugs in the past 30 days, and a just a little greater opportunity if you're considering simply the population of LA. Exactly what do these amounts imply? They imply that drug addiction is prevalent enough that it's simple to come to be addicted to something, and challenging to depart patterns of self-damaging reliance. Regardless of exactly what some media might have you think, drug addiction isn't really something that just takes place in low-income populations and seedy communities. It's something that occurs anywhere, across the board. Because it's such a normal difficulty in our modern-day culture, it comes to be complicated to discover sufficient support and support if you choose to try to depart your addiction. Drug rehabilitation programs deliver merely that, however are routinely underused by those that require them a lot of. In 2006, about 4 million individuals participated in some type of drug rehab in The united state. It's predicted that yet another 20 million called for however did not look for rehab services. In an urban place like Los Angeles, drug addiction is much simpler to support than it is to end. Heroin, cocaine and additional hard drugs are offered in surprising supply. Paired with these drugs comes an amount of significant wellness dangers, along with the psychological and economic influence that an unrestrained drug addiction can easily have on an individual's life and social network. Lots of delay too long to pursue treatment, and are currently physically and mentally harmed when they at last meet up with a skilled expert that can easily assist them survive their drug addiction. If you're coping first-hand with the truths of drug addiction in Los Angeles (or anywhere else), you're not alone. California drug rehab program experts are readily available, and will certainly cost less than a proceeded addiction will. The outcome is that you'll be mentally and physically steady, able to support a household and sustain a job. If you're taking into consideration getting in a rehab program, the faster you act, the much simpler your recovery will certainly be. Will The New Air Pollution Science Choke City Planners?